This statement clutch will put you in the spotlight! 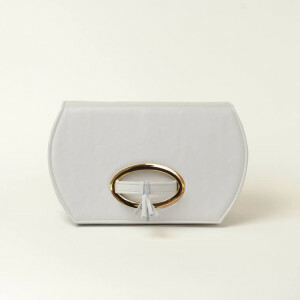 A stylish dove grey structured clutch bag that is comfortable to carry with its innovative hand loop. Detachable magnetic key fob inside. Thank you for visiting N.Were Designs. It truly is a privilege to share my work with you and I hope you will visit the site again soon. All the best, Nelson Were. Quex Craft Village, Quex Park Estate, Park Lane, Birchington, Kent, CT7 OBH.